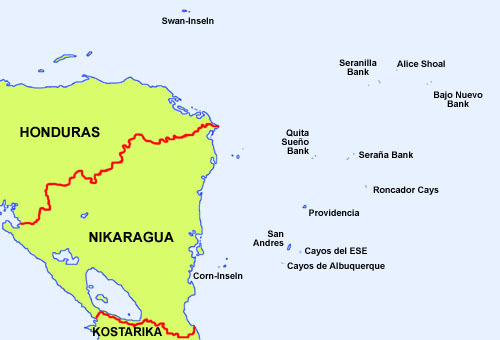 Diese Inselgruppe liegt etwa 250 km vor der Ostküste Nicaraguas (Moskitoküste) im Karibischen Meer. Sie besteht aus den Hauptinseln San Andrés und Providencia sowie aus vielen kleineren Eilanden die bis zu 600 km entfernt sind. This archipelago is situated ca. 150 miles in front of the eastern coast of Nicaragua (Mosquito Coast) in the Caribbean Sea. It consists of the main Islands St. Andrews and Providence as well as of many smaller isles partially in a distance of 375 miles. 1990/1991 · Kolumbien errichtet das Departement "San Andrés, Providencia y Santa Catalina"
16271629 · On Providencia and Santa Catalina arise English and Netherlands settlements as bases for caper ventures against Spain, from Jamaica and other islands come employees on this islands, San Adrés Island is for that time being named "Henrietta"
1990/1991 · Colombia establishes the Department of "San Andrés, Providencia y Santa Catalina"
The Bajo Nuevo Bank (Petrel Islands) is a reef (ca. 16 mi. long and 5,5 mi. broad) with some lonely seldom by grass covered islands. The largest and mostly known island is Low Cay (300 m long, 40 m broad, up to 2 m high). There are no permanent residents, but at times lobster hunters. The Bajo Nuevo Bank is since 1980 on Low Cay marked by a lighthouse. The USA appropriated that islands in the year 1856 by the so named "Guano Act", ostensibly because of its guano resources. In the year 1982 the USA returned that islands back to Colombia. The Bajo Nuevo Bank is claimed by Jamaica. The Serranilla Bank is a reef (ca. 25 mi. long and 20 mi. broad) with some lonely by grass, shrubs and trees overgrown islands. The largest and mostly known are: Beacon Cay, Middle Cay, East Cay and West Breaker. The reef is in use as graveyard for ships. On Beacon Cay  the largest island of the reef  there are abandoned buildings of an in the sixties plyed USA military base. The Serranilla Bank is since 1977 marked by a lighthouse. The USA appropriated that islands in the year 1856 by the so named "Guano Act", ostensibly because of its guano resources. In the year 1982 the USA returned that islands back to Colombia. The Serranilla Bank was claimed until 1999 by Honduras. The Quita Sueño Bank is a reef, its 23 mi. long northeastern part dries partly at low tide. Real islands there are not. The Quita Sueño Bank is since 1977 marked by a lighthouse. The USA appropriated that islands in the year 1856 by the so named "Guano Act", ostensibly because of its guano resources. In the year 1982 the USA returned that islands back to Colombia. The Serrana Bank (Serraña Bank) is a reef (ca. 31 mi. long and 8 mi. broad) with some lonely by grass, shrubs and trees overgrown islands. The largest and mostly known are: Southwest Cay, Narrow Cay and North Cay. On Southwest Cay (ca. 0,4 sq.mi.) there are abandoned buildings of an in the sixties plyed USA military base. The Serrana Bank is on Southwest Cay and on Narrow Cay since 1977 marked by two lighthouses. North Cay Island is permanent inhabited by some turtle and lobster hunters. The USA appropriated that islands in the year 1856 by the so named "Guano Act", ostensibly because of its guano resources. In the year 1982 the USA returned that islands back to Colombia. The Roncador Bank is a reef (ca. 9 mi. long und 3,5 mi. broad) with some lonely seldom by grass covered islands. The largest and mostly known island is Roncador Cay (600 m long, 300 m broad and up to 4 m high). There are abandoned buildings of an in the sixties plyed USA military base and an inactive lighthouse. The Roncador Bank is since 1977 marked by a new lighthouse. The USA appropriated that islands in the year 1856 by the so named "Guano Act", ostensibly because of its guano resources. The Cayos del E.S.E. (Cayos del Este Sudeste, Courtown Cays) are a reef (ca. 8,7 mi. long and 2,5 mi. broad ) with some lonely by grass, shrubs, trees and mangroves overgrown islands. The largest and mostly known are: Cayo del Este, Cayo Bolivar, West Cay, and Cayo Arena. The Cayos del E.S.E. are marked on Cayo Bolivar by a lighthouse. There are even two buildings, however no permanent residents but sometimes fishermen. The Cayos de Albuquerque (Cayos de S.W., Southwest Cays) are a reef with a diameter of ca. 4,5 mi. with some lonely by grass, shrubs, trees and mangroves overgrown islands. The largest and mostly known are: Cayo del Norte and Cayo del Sur. The Cayos de Albuquerque are marked on Cayo del Norte since 1980 by a lighthouse. Das Departement ist benannt nach den wichtigsten Inseln "San Andrés", "Providencia" und "Santa Catalina". San Andrés bezieht sich auf den Heiligen Andreas, einem Apostel, Fischer und Bruder des Petrus. Providencia heißt Vorsehung, und Santa Catalina meint die Heilige Katharina (Katharina von Alexandria) eine Märtyrerin, die wegen ihres Glaubens gefoltert und dann enthauptet wurde. The department is named like the most important islands "San Andrés", "Providencia" and "Santa Catalina". San Andrés points out to the Holy Andrew, an apostle, fisherman and brother of the Petrus. Providencia means providence and Santa Catalina means the Holy Catherine (Catherine of Alexandria) a martyr which was tormented and decapitated because of her belief.